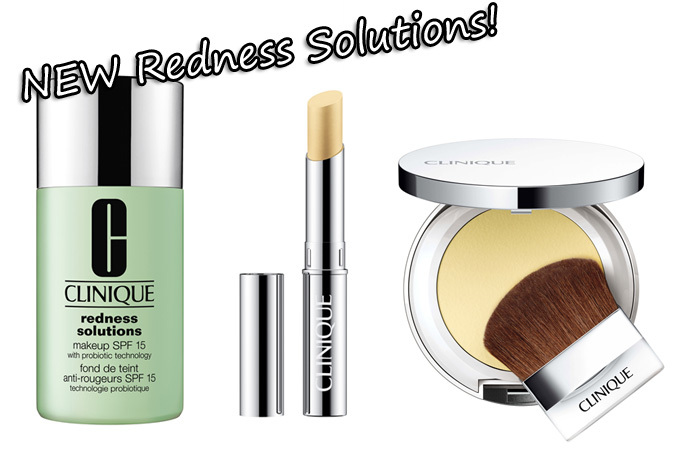 Clinique are introducing three NEW products to their popular Redness Solutions lineup. Now this is exciting! The first premium-brand to offer a foundation that not only promises to give redness specific coverage but also offer treatment benefits for mild to moderate facial redness. Well, that’s me… I’m very curious to see if this makes any real difference in camouflaging compared to my normal foundations. I’m not convinced on the SPF 15 though, I think that a foundation specifically aimed at sensitized skins would have benefited from a slightly higher protection rating. A yellow-toned stick concealer that promises to neutralise and conceal areas of redness. I’m wary of these… in the past I’ve tried Benefit’s You’re Bluffing yellow-toned stick concealer and it just didn’t do much for me. I won’t discount this one yet… but it’s not something I’d buy without being shown exactly how to use it for best effect on counter. This powder can be used alone, under or over makeup and claims to make visible redness and broken capillaries virtually disappear. If this is anything like Clinique’s loose mineral powders… it’s gonna be gorgeous. I find them to be super-fine and invisible whilst doing the job they’re designed for. The new redness solutions additions will be available on counter from the 15th October. I for one, will be checking them out! You’re bluffing did nothing for me either …. The Lancome foundation Teint Miracle on the other hand gives me an excellent base and hides the redness. Still think that I will check this range out though ! Clinique sent me the new powder and foundation to try, so far I am really impressed with how it covers my redness. Laura Mercier Silk Creme foundation is great for covering redness and feels light too. I’ve tried a few things from Clinique but I have never really gotten into the brand, although this foundation sounds interesting. I saw the foundation released earlier this week on boots.com, was very tempted I have to say. So the powder is quite good? My redness isn’t from sensitive skin I don’t think…more spotty & blemish-y. If you think it’s worth it I might invest! On the other hand, I really like you’re bluffing, it really covers my spots. Now this is seriously interesting, although I agree 100% that the foundation should be at least SPF 30 or maybe even higher. I will have to try this out for my rosacea prone skin. I once tried a cream from the line after a facial and wowza it calemd my skin down, the redness was gone. Definitely interested in the redness solutions makeup! This is pretty exciting! I can hardly wait to get it. Boy, Clinique has been stepping up their game lately! Agreed about their loose powders, they ‘re prob among their best products! Very intrigued about this one too now…! Leila got her nails did!